Inspired by Asian flavours, this way of cooking mussels is an interesting take on “traditional” steamed mussels! TIP: you can keep any leftover curry paste for two weeks in the fridge. Recipe from Bart’s Fish Tales. Carrera Culinair. When the moisture is boiling, add the mussels and mix with the sauce. Place a lid on the pan and steam the mussels for 5-7 minutes. Stir once in a while. When all mussels are opened, add half of the spring onion, red chili and koriander, mix again. 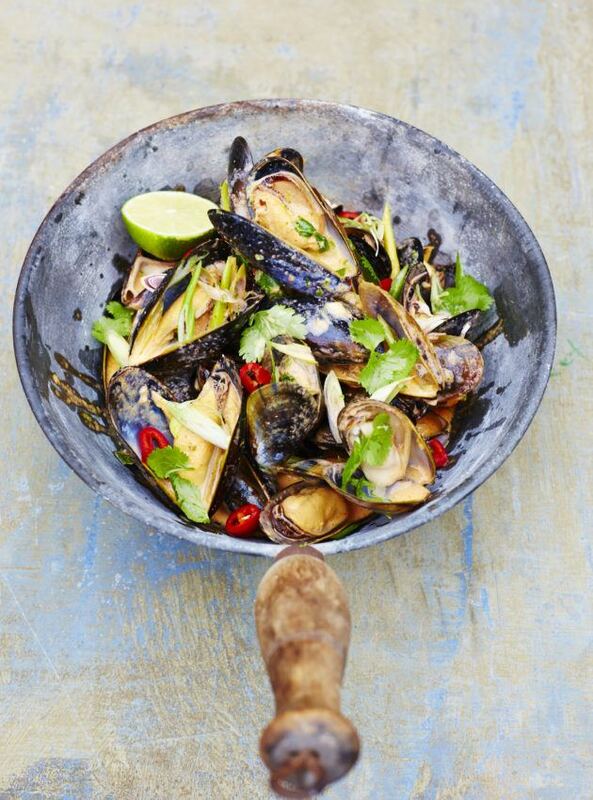 Serve the mussels and garnish with the left spring onion, red chili, koriander, lemon grass and lime. Enjoy!